Sherlock Holmes Never Said "Elementary, My Dear Watson"
“Elementary, my dear Watson“, sometimes quoted as, “Elementary, dear Watson“, is one of those phrases that everybody knows the character of Sherlock Holmes said. You know, just like everyone knows that Kirk said “Beam me up Scotty” and Darth Vader said, “Luke, I am your father”. The thing is, none of those characters ever said any of those things. They said things that were similar, sure, but they never actually said those exact words, despite the fact most think that they did. Like “Luke, I am your Father“- which was actually, “No, I am your father“- Holmes never said “Elementary my dear Watson” in any of the original 56 short stories or 4 novels starring his character. The closest he comes is in, The Adventure of the Crooked Man. Beyond that, there are only 7 other instances of the word “elementary” being uttered in the official Sherlock Holmes works, though he does say “my dear Watson” numerous times, with the phrase appearing in about 2/3 of the stories, sometimes several times within a given story. 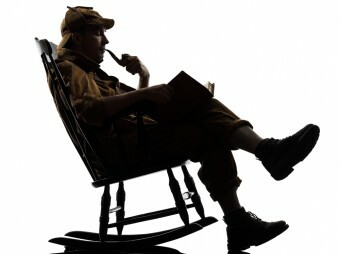 It’s noted by Sherlockian.net, one of the foremost sources on everything to do with Sherlock Holmes, that although Holmes never uses the oft misquoted phrase, “elementary, my dear Watson“, he does use the phrase, “exactly, my dear Watson” in 3 different stories. For example in His Last Bow, where Holmes uses the phrase in a shoddy attempt to mask the obvious sexual tension between himself and his man servant… Or, you know, to agree to Watson’s point. Wodehouse’s work was noted to have taken obvious cues from Doyle’s, as you probably guessed from the fact that Wodehouse ended up writing one of the most enduring quotes for a character he didn’t create. So when was the first time someone playing Sherlock Holmes actually said this? That isn’t completely clear. The first well documented actor playing Sherlock Holmes to use the phrase was one, Clive Brook in a 1929 film, The Return of Sherlock Holmes. Another theory sometimes put forth is that it was perhaps the stage actor, William Gillette in 1899, preceding not only Clive Brook’s 1929 film, but also the P.G. Wodehouse serials quoted above. Though this could potentially be true, evidence that has survived to today points to Gillette using a slight variation on the phrase in one of his stage productions, rather than the exact phrase. The production, aptly called, Sherlock Holmes: A Drama In Four Acts which was written in part by Gillette in 1899, features a line that read as follows, “Elementary, my dear fellow! Ho! (*Sneer) Elementary“. This is noted as being a bastardized version of the “Exactly, my dear Watson” line Doyle used in his own work several years earlier and the line used by Brook 30 years later is noted to be a natural evolution of Gillette’s own line. So just to make sure you’re following this. “Elementary, my dear Watson“, was never once uttered in the accepted canon of Sherlock Holmes, the line as we know it is actually a bastardized version of a bastardized version of a similar line used in an earlier Sherlock Holmes story. Does the fact that Sherlock Holmes never actually said this line make it any less quotable? Probably, yes. But what the hell, the story of how it came to be is so convoluted it’s kind of fitting for a Sherlock Holmes fact, don’t you think? William Gillette is also credited with inventing or popularizing a number of other common Sherlock Holmes mannerisms. Most notably his deerstalker hat and crooked pipe, the latter of which was believed to have been used by Gillette to make his face easier to see on stage. Sir Arthur Conan Doyle originally tried to kill off Sherlock Holmes in order to have more time to devote to writing historical novels, but popular demand and even threats to his person and life, eventually caused him to reconsider and bring the character back. In the short story, The Last Bow, ‘exactly, my dear Watson,’ does not appear once. It appears in the first adventure in the larger book by the same name, in a conversation about alibis. I checked up the source, which stated the ‘3 times’ bit, and not the reason why. Before I start to sound stuck up, let me first give you a sincere thank you for introducing me to the series in the first place. I dearly love any new reading materiel, especially of such a caliber. Since I’ve only read most of the stories once, I cannot claim to be an expert on this, but I would recommend that you check the above information. *Basil Rathbone* as Sherlock Holmes responds to Nigel Bruce’s Watson mocking comment with “No, elementary, my dear Watson, purely elementary” at approximately 12:13 into the movie version of “The Adventures of Sherlock Homes” 1939. SH is testing violin notes in the hopes of annoying the housefly. People have long believed Holmes and Watson were intended to be together in the original ACD canon but weren’t written explicitly so for obvious reasons. This snarky comment only makes you look silly.